In the late 1980s, Deborah Freehling, MD, a facial plastic surgeon in Northern California, had just finished her residency. The hospital was no longer her second home. Suddenly, she was in an 8:30 to 5:30 job. She had time to spare a foreign concept. On her time off, she started volunteering for the Redwood City Police Department, removing tattoos from former gang members to ease their transition back into mainstream society and boost their chances of finding jobs. She developed an affection for people—especially young people—who wanted a clean slate, a do-over for a decision they now regretted. Incorporating tattoo removal into her otolaryngology practice would seem to have made sense, but that didn’t happen right away. “Back then, the lasers were just awful; they were CO2 lasers, extremely painful. They burned the skin; they scarred the skin,” she said. She was equally unimpressed by subsequent lasers. Then, last year, Dr. Freehling learned about a new type of laser that delivers energy in bursts that are shorter in duration than those of older lasers. 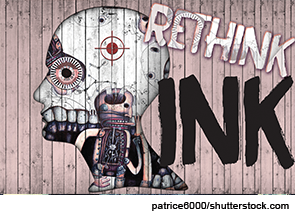 While traditional lasers rely on heat, these lasers shatter tattoos into tiny particles that the body can eliminate. Dr. Freehling is now performing tattoo removal in her practice, entering a market that has been on the rise. A 2012 Harris Interactive Poll found that 21% of adults in the United States have a tattoo, up 7% from four years earlier. The same poll found that 14% of people with tattoos regret having received one. 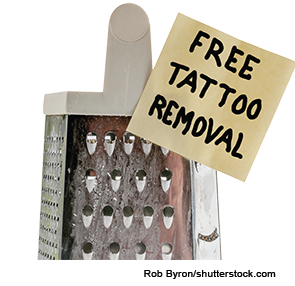 Opportunity might exist for otolaryngologists who want to add tattoo removal to their practices. But those with experience say that careful planning is needed to fit the procedure into your overall scheme and that the large financial expenditures involved make it a decision that shouldn’t be made lightly. If the market isn’t right, it might not be a good idea at all. Dr. Freehling added tattoo removal to her practice approximately a year and a half ago. She had the money to spend, and it was largely a matter of deciding to do something that she enjoys. “It was a time in my life when I was still busy, very busy, and doing surgery, but realized that as I get older I am not going to want to be doing five-hour, six-hour cases,” she said. “I thought, How can I combine something that I really enjoy doing with something that helps people and feels useful, while I’m cutting back on my heavy surgical load?” She also wanted to choose a procedure she could hire a nurse practitioner to assist with if she got too busy, so that she could still offer the service at her practice while not having to always perform it herself. In 2014, Cynosure (Westford, Mass.) introduced a handpiece for its PicoSure laser that allows the laser to be used for acne, scar removal, skin tightening, and other cosmetic procedures. The laser is expensive: Dr. Freehling spent approximately $330,000, including taxes, and a maintenance agreement adds another $17,000 a year. But, she said, she has already covered her initial investment. “Patients are really, I think, happy with it,” she said. Steven Dayan, MD, a facial plastic surgeon in Chicago, has had a different experience with tattoo removal. He has tried it—not once, but twice—only to abandon it both times, though he adds that it can be right for some practices. “I thought it made a lot of sense,” he said, noting that a lot of people between the ages of 25 and 35 have tattoos. He still performs tattoo removal in easier-to-remove cases when directly approached by a patient, but he no longer markets for it. And he won’t perform the procedure on the more professionally applied tattoos with intricate designs and an array of colors. Then, like Dr. Freehling, he learned about the PicoSure, and has found the results to be much better—and worth keeping in his practice. “We were all of a sudden going from telling people, ‘You need 10 to 15 treatments,’ [to] getting clearance of tattoos in anywhere from four to six treatments.” He said the laser can struggle with reds, and he frequently refers patients with bright reds to other practitioners with Q-switched lasers, which use a different laser technique and tend to perform better with that color. What really makes the laser worth the expense and time is its ability, with the handpiece, to perform skin tightening and other procedures without the downtime for the patient that other lasers cause, Dr. Kleiman said. “What we found out after we discovered this other application and how effective it was in terms of its results and the patient acceptance of the procedure, is that it generated as much patient interest and volume as the tattoo [removal],” Dr. Kleiman said. 45 million Americans have at least one tattoo. 17% regret ever receiving one. $76 million: 2014 revenue from tattoo removal in the U.S.
$83 million: Expected 2018 revenue from tattoo removal in the U.S.